The Global Volcanism Program has no activity reports for Amboy. The Global Volcanism Program has no Weekly Reports available for Amboy. The Global Volcanism Program has no Bulletin Reports available for Amboy. The Global Volcanism Program has no synonyms or subfeatures listed for Amboy. 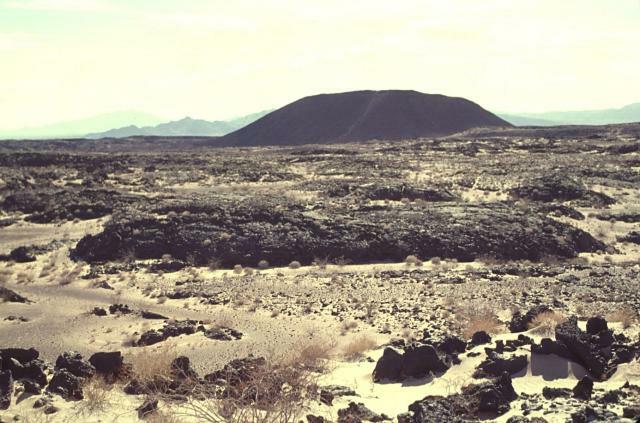 The 70-sq-km Amboy basaltic lava field was erupted onto a flat-lying alluvial valley from Amboy Crater, a prominent cinder cone with four nested craters that rises 75 m above adjacent lava flows at the NE end of the lava field. The dominantly pahoehoe lava field divided the Bristol Dry Lake, occupying a depression between the Bristol and Bullion Mountains, into two playas. The cone and flow were originally considered to be early Holocene in age, but more recent surface exposure dating (Phillips, 2003) has given a 79,000 +/- 5000 yr BP age. Chesterman C W, 1971. Volcanism in California. Calif Geol, 24: 139-147. Luedke R G, Smith R L, 1981. Map showing distribution, composition, and age of late Cenozoic volcanic centers in California and Nevada. U S Geol Surv Map, I-1091-C.
Miller C D, 1989. Potential hazards from future volcanic eruptions in California. U S Geol Surv Bull, 1847: 1-17. Parker R B, 1963. Recent volcanism at Amboy Crater, San Bernardino County, California. Calif Div Mines Geol Spec Rpt, 76: 7-21. Phillips F M, 2003. Cosmogenic 36Cl ages of Quaternary basalt flows in the Mojave Desert, California, USA. Geomorphology, 53: 199-208. The Global Volcanism Program is not aware of any Holocene eruptions from Amboy. If this volcano has had large eruptions (VEI >= 4) prior to 10,000 years ago, information might be found on the Amboy page in the LaMEVE (Large Magnitude Explosive Volcanic Eruptions) database, a part of the Volcano Global Risk Identification and Analysis Project (VOGRIPA). There is no Deformation History data available for Amboy. There is no Emissions History data available for Amboy. The Global Volcanism Program has no photographs available for Amboy. There are no samples for Amboy in the Smithsonian's NMNH Department of Mineral Sciences Rock and Ore collection. Large Eruptions of Amboy Information about large Quaternary eruptions (VEI >= 4) is cataloged in the Large Magnitude Explosive Volcanic Eruptions (LaMEVE) database of the Volcano Global Risk Identification and Analysis Project (VOGRIPA).